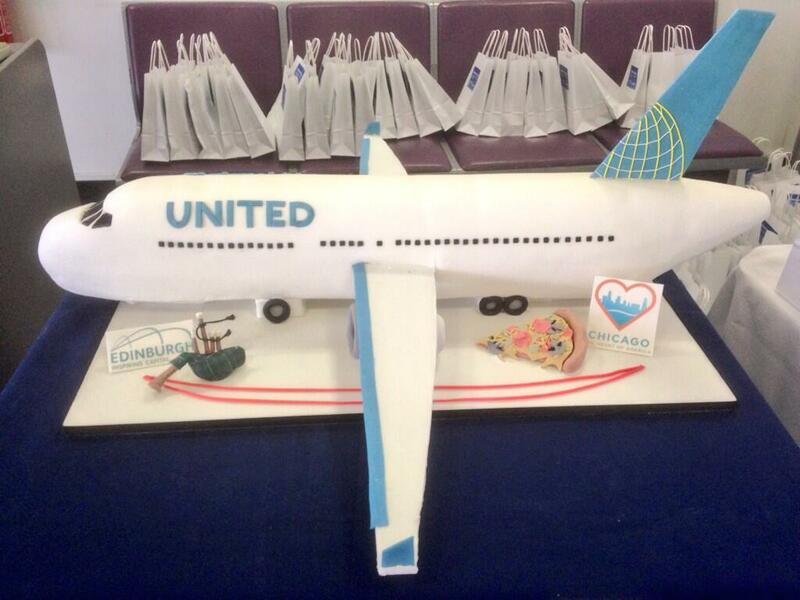 Edinburgh Airport, Friday 23rd May, 2014: 9:00 – there is quite a party at the United Airlines Departure Gate as a group of VIP guests and media mingle with the first passengers who are arriving to board the inaugural flight from Edinburgh to Chicago O’Hare. 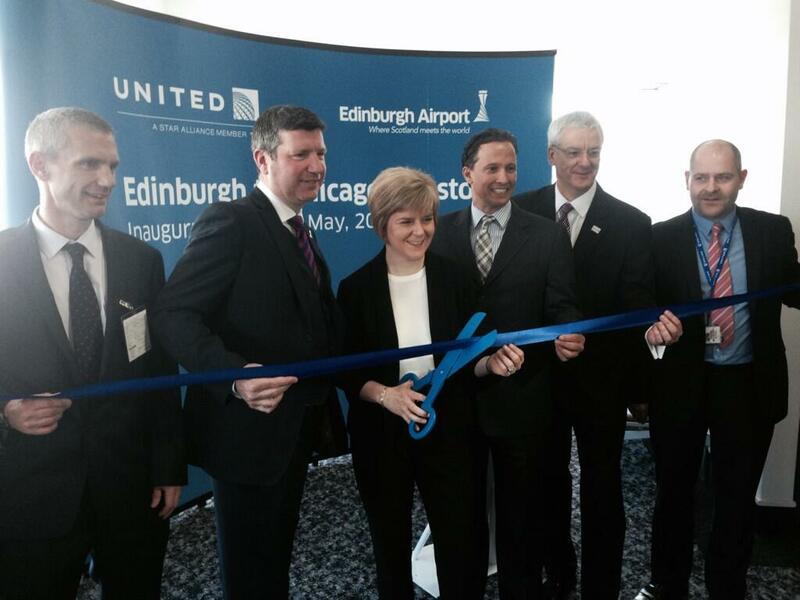 Jake Cefolia, United‟s Vice President Atlantic and Pacific Sales was joined by Nicola Sturgeon MSP, Scotland‟s Deputy First Minister, and Gordon Dewar, Chief Executive of Edinburgh Airport for a ribbon-cutting ceremony to celebrate the new route. United has operated a direct flight from Edinburgh to New York for the past fifteen years, so this now extends the USA-Scotland connection with this first scheduled non-stop service to and from Chicago. The first season will operate from May 23 to Oct. 6, 2014. It was a lively occasion with musical entertainment from the Blues Brothers and fine American hospitality – Bucks Fizz, giant beef sarnies, pretzels, potato chips, coffee and cupcakes. 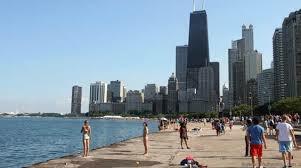 In his introduction, Mr Cefolia described Chicago as the “most American of US cities” – the architecture, Blues and Jazz and famous deep pan pizza. 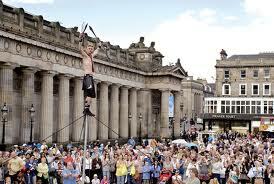 By all accounts it’s a cosmopolitan, cultural city, rich in history, heritage and Arts Festivals. I met a young couple, Caroline and Dougie from East Linton, enjoying the party atmosphere before the 10.25 am flight. But Chicago was not where they had planned to travel today!. They were intending to fly via London to Washington. But earlier that morning the Heathrow flight was cancelled thus missing the onward connection. Quick change of itinerary and seats were booked on this flight to Chicago. From a disappointing start to their American holiday, it all worked out very well indeed, with a transfer from O’Hare to Washington. Another traveller in the Departure lounge is Benjamin a first year Biology student at Edinburgh University. His home town is San Francisco so that this flight via Chicago is fast and convenient, a route he plans to take again when he returns in August for the Festival before next term. The launch of this direct flight is certainly vital to entice international visitors to Scotland. “2014 is a massive year for Scotland. Huge global events – the Ryder Cup, Commonwealth Games and Homecoming Scotland – represent a great opportunity for tourism businesses.” Mike Cantlay, Visit Scotland. 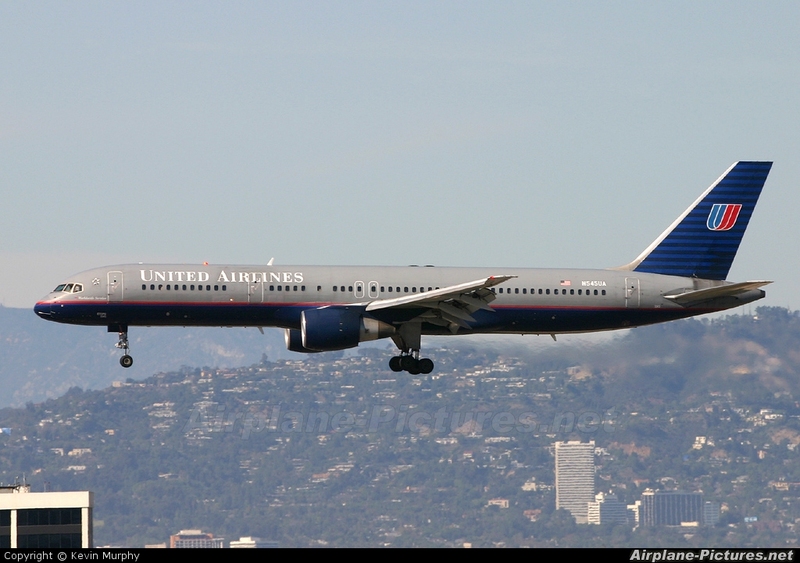 United will operate a Boeing 757-200 aircraft with 169 seats – 16 flat beds in United BusinessFirst and 153 in United Economy and Economy Plus. Chicago /O’Hare airport is a major US hub with onward connections to more than 125 destinations across North, Central and South America and the Caribbean. 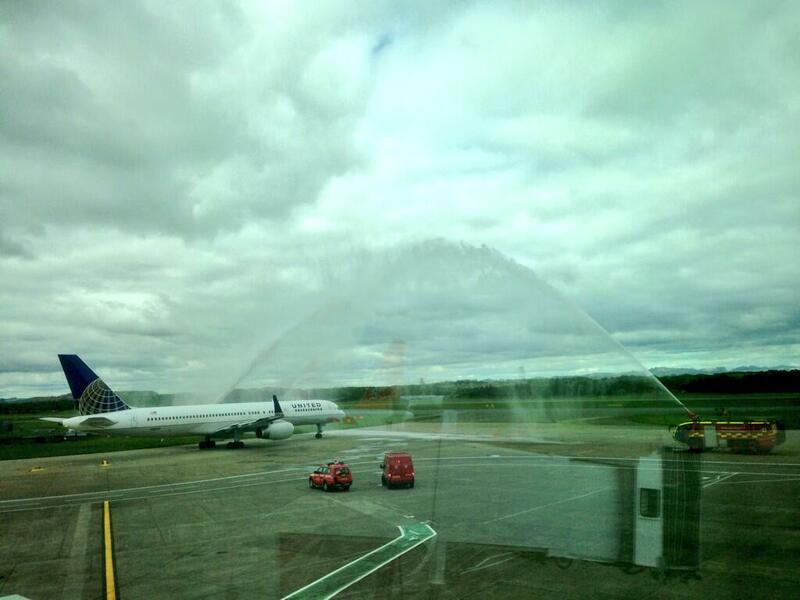 The United flight 119 left bang on time, 10.25am, slowly taxiing out to the runway to receive the special water cannon salute to celebrate the inaugural flight from Edinburgh nonstop to Chicago. Summer is coming and time to get fit, beach trim, bikini slim, eat well and watch the calories. Well, I have just signed up at Curves (the fabulous Women-only fitness club) to start a regime of daily exercise before I jet off to Italy on holiday. It’s just five minute from my flat in Stockbridge, Edinburgh so no excuses to get there.! The other good news is that I can also pop into my local PizzaExpress (virtually opposite Curves! ), for a tasty al fresco lunch or supper over the summer. 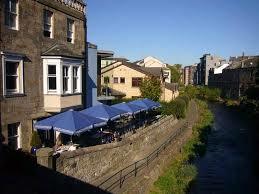 The Stockbridge PE has an outside terrace by the river. Bliss! Who says Italian food is fattening?. The Mediterranean diet is one of the healthiest in the world – olive oil, sundried tomatoes, seafood, aubergine, peppers, chicken, pizza, pasta and light, dry wines. PizzaExpress has always been health-conscious to encourage diners to enjoy good food and also eat well. 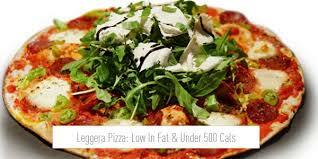 The lower calorie Leggera range of pizzas (under 50 cals), have always popular since launched a few years ago and Men’s Health Magazine recommended P.E as a great place to eat in its recent Restaurant awards. 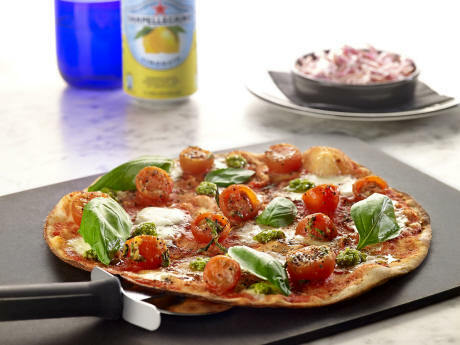 Starting in Edinburgh in April, Pizza Express launched their Spring > Summer menu with a special range of light, healthy dishes, soups and salads. This should entice you to escape for an hour to enjoy a quick, tasty, well priced lunch served from Monday to Friday. The brand new Leggera SuperFood Salad is Gluten-free and even suitable for those on the 5:2 diet. 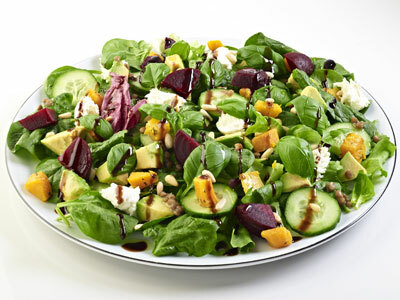 Tuck into this summer-time feast – baby spinach, roasted butternut squash, beetroot, light baby mozzarella, avocado, pine kernels, cucumber, lentils, fresh basil and you will consume only 256 calories. Or try the classic Nicoise with tuna and anchovies, or Pollo with chicken and goat’s cheese. The Leggera Salmon Salad, (oak roasted salmon with peppers, avocado and rocket leaves) is just 400 calories. Piadinas are bread pocket wraps filled with fresh ingredients such as Chicken & Avocado – avocado, chicken, tomato and Cos lettuce. Specially designed for a light lunch are the new Romanita Pizzas with a thin and crispy base and your choice of favourite toppings from American Hot to Veneziana. 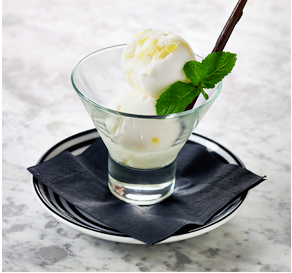 Treat yourself to a refreshing Lemon Sorbet (low calorie, gluten free) to finish your meal. “The great thing about our new lunch menu is that it offers busy people a fresh, fast, great value option for lunch. 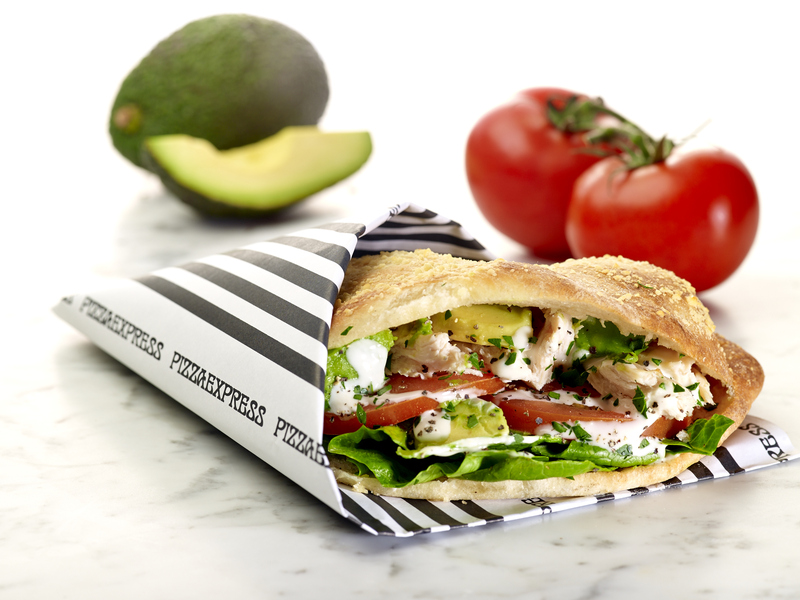 Piadinas offer a real twist on the traditional sandwich, along with salads, soups and smaller Romanita pizzas” Jamie Fleming, Manager at PizzaExpress Edinburgh. And of course there’s a fantastic range of tasty, healthy pizzas, pastas and salads for leisurely weekend lunches and meeting friends for dinner. I can’t wait to try out the new summer menu of Italian good food at my favourite local Pizza Express – I’ll let you know all about!. Gin and Tonic – the quintessential summer cocktail, and all year round! But who was the clever person who invented it? . 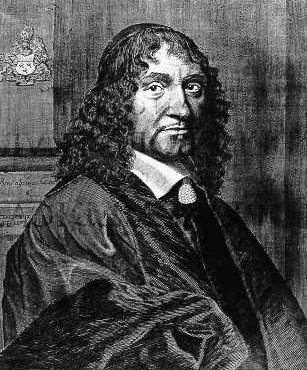 Despite conflicting sources, it originated in 1658 when a Dutch professor of medicine, Franciscus de la Boe (1614-1642) was trying to concoct a cure for stomach complaints. He investigated the diuretic properties of juniper berries and unwittingly created this alcoholic infusion which he named Genever. Once introduced into Britain, there began a Gin Craze with high consumption across all classes leading to the term “Mother’s Ruin”. A tax was introduced in 1736 but this merely encouraged people to distill their own illegal liquor and open secret gin drinking dens. 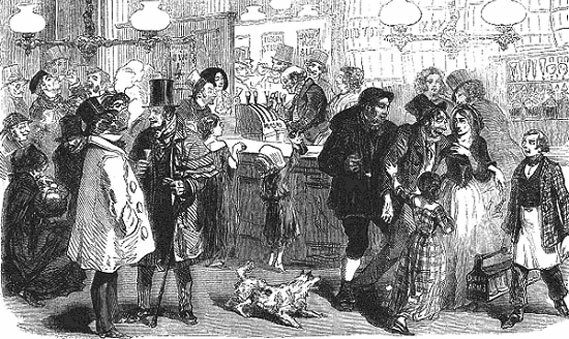 Due to licencing laws, the gin craze ended by the end of the 18th century. 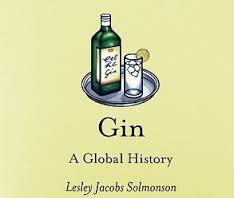 But it was the love affair of gin and tonic during the British Raj in India and across the Colonies, which developed the aperitif as a distinctly classy cocktail. Again this was seen as medicinal as a key component of tonic water is quinine, an anti-malarial alkaloid from the bark of the cinchona tree. 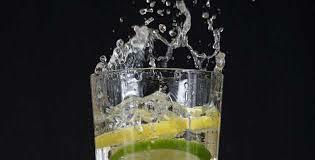 With a slice of lime or lemon, (a daily dose of Vitamin C), it was the perfect tipple when living in the tropics. 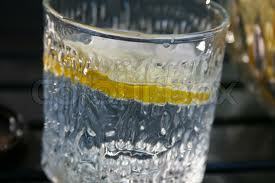 The light, dry and refreshing Gin we drink today is a spirit based on either grain or molasses which is tasteless. The flavour comes from Botanicals which vary from producer to producer and are regarded as very much of a trade secret. All gins include Juniper with a selection of herbs and spices – coriander, lemon peel, cinnamon, nutmeg, orange peel, angelica and cardamon. 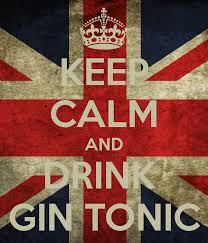 Typically, fine gin contains between six and ten botanicals. It’s a fascinating history which keeps developing due to the ingenious gin distillers, many of which are based in Scotland. World famous for Scotch whisky, but today we are also renowned for producing the finest Gin – a new spirit for Scotland. Boë Superior Gin, the premium spirit from Stirling-based VC² Brands, has been awarded Silver in the Contemporary Gin category at the 2014 World Gin Awards. This very special, highly acclaimed gin created in the village of Doune is described as “Clean, spiced and strikingly refreshing”. The World Gin Awards are part of the prestigious World Drinks Awards programme, launched in 2007 with the World Whiskies Awards and World Beer Awards. Presented by thedrinksreport.com, the World Gin Awards select, reward and promote the best Gin Taste and Design. 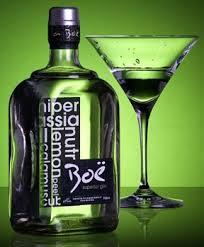 Boë Superior Gin is of course named after the Dutch inventor, Franciscus (Franz) de la Boë, and the high a.b.v. (47%), reflects the original concept of the high-alcoholic Genever. Distilled in small batches using the Carterhead Still ensures the botanical vapours are preserved. Boë has a distinctive flavour due to the selection of a dozen key botanicals, herbs and spices. Juniper berries are the essential ingredient together with an ingenious blend of Coriander, Angelica, Ginger, Orris Root and Cassia Bark – or Chinese cinnamon, Orange and Lemon peel, Cardamom Seeds, Liquorice, Almonds and the peppery tones of the Cubeb Berry. Graham Coull, director of VC² Brands, commented: “To see Boë Superior Gin receive this accolade is a great day for our business and proves that Boë is a world class product capable of holding its own in the global drinks market. So now for my own tasting and testing of this award winning World Class Gin, in the company of my sister in law, Ruth, a serious gin connoisseur. After extensive research – ensuring correct measures of a splash and a dash, the gin and tonic, the ice & slice – we found the Boë gin to be extremely delectable to sip and savour. With an abv of 47% it is strong on the alcoholic front but this comes through as warmth when combined with the right flavours. Consisting of 13 botanicals there’s a multitude of flavours that come through – hints of vanilla, ginger and coriander but overall a clean, slightly spicy but refreshing gin. We tried it on its own drizzled over ice and with cucumber, lime and lemon. Lemon complemented it the best – we then detected on the taste buds a soupcon of orange and lemon peel in it somewhere along the line. A slice of lime was too harsh a contrast and the cucumber just didn’t work at all. It just shows the extraordinary range of Gins where some brands can only properly be sipped with cucumber to bring out the depth of flavour. And a final word from Ruth, the expert gin drinker ..
“As I nowadays only enjoy a gin with lime, it surprised me how much I enjoyed this one with lemon – I know shouldn’t be a gin snob! So overall a very pleasant gin, well balanced , fresh, citrusy and moreish! The good news is that Gin is so, so glamorous and fashionable now with speciality gin bars, and expert mixologists suggesting selected styles of tonic, slices of apple, lime, orange or cucumber to match each distinctively different brand of gin. 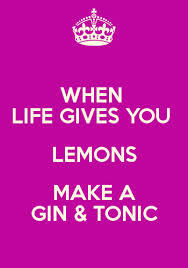 A new Gin Craze is certainly here in Scotland – Cheers! Stir Boë Gin and vermouth in a mixing glass with plenty of ice. Strain the mixture into a chilled cocktail glass. Garnish with the olive or lemon twist. Through these catchy, iconic songs – , “New York, New York” and “Chicago, is my kind of town”- Frank Sinatra became – and still is – an unwitting tourism ambassador to sell the American dream to international visitors. You may have ticked the Big Apple off your travel bucket list so now it’s time to check out Chicago . For residents in Edinburgh – and around Scotland – there’s nothing to stop you now with a new direct flight with United Airlines jetting off to on 23 May, 2014. United already flies year round from Edinburgh and Glasgow to New York, so this is a very exciting new venture to promote tourism in each direction, USA to and from Scotland, and for business travellers. It’s all part of current major investment and expansion at Edinburgh Airport, the busiest in Scotland. The service will operate five times weekly until 12 June and daily during the peak summer season between 13 June and 2 September; then four times weekly between 3 September and 6 October. The flight timetable is very convenient. 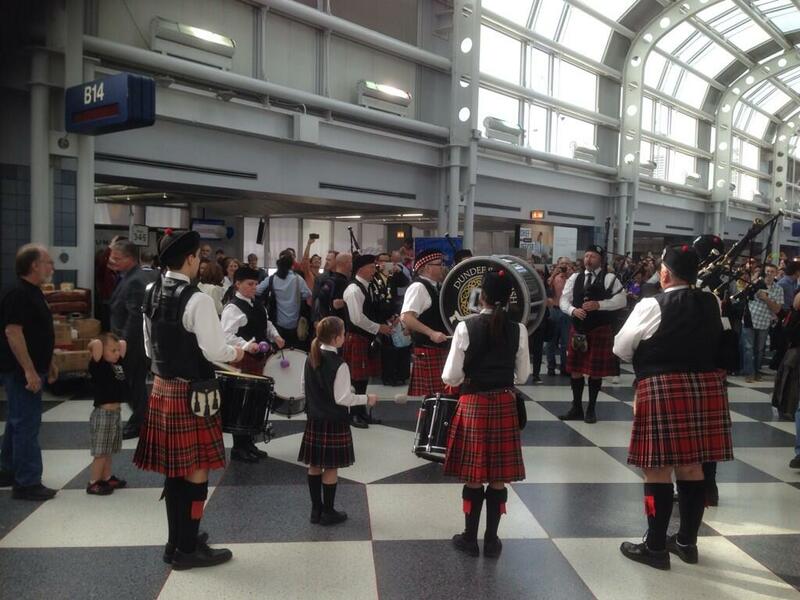 The Edinburgh-Chicago flight will depart at 10:25 am arriving at 1:00 pm. Depart Chicago at 6:00 pm arriving Edinburgh at 7:45 am. the following day. United will operate a Boeing 757-200 aircraft with a total of 169 seats – 16 flat beds in United BusinessFirst and 153 in United Economy. The BusinessFirst cabin is designed for the world traveller: priority check in, spacious comfortable seats /6’6” flat beds, superlative cuisine with fine wines, personal on demand entertainment (movies, music, games). The Economy cabin offers quality and comfort, complimentary meals and personal video screen. 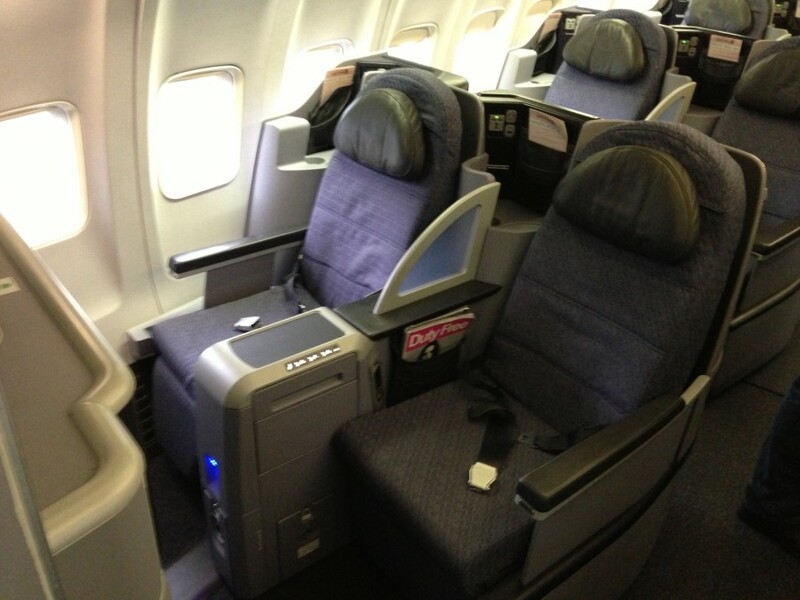 The Economy Plus seats are popular for the good value, extra legroom and space. Chicago /O’Hare airport is a major US hub with onward connections to more than 125 destinations across North, Central and South America and the Caribbean. The airport has been voted the best in North America for thirteen consecutive years by readers of Global Traveler. Last year on a Silversea cruise, I met several guests from Chicago – upfront, sociable, genuine, hard working, fun loving, friendly people. So I would love to see their kind of town. So why Choose Chicago. ? 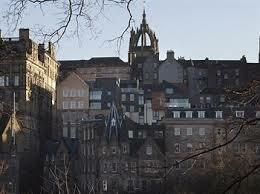 By all accounts it’s a cosmopolitan, cultural city, rich in history and heritage. Edinburgh and Chicago are like twin cities, both boasting classic architecture and inspiring arts Festivals – not forgetting cold winters! . 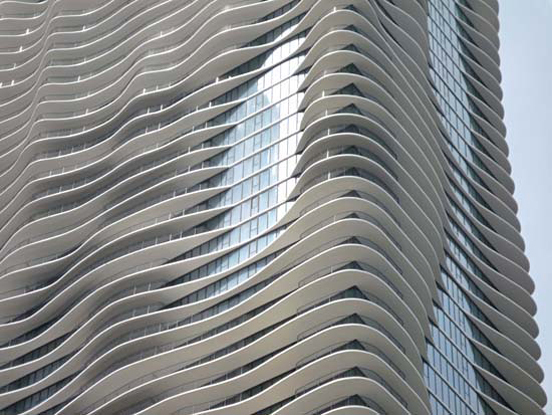 Across the Atlantic, the picturesque skyline of Chicago can easily compete with Manhattan, with its stunning buildings towering along the shores of Lake Michigan. What is unique are its miles of beaches and green open parkland for leisurely days and outdoor adventures. This is gourmet city with the choice of eating and drinking for every taste and budget, famous for deep dish Pizza and Italian beef, and the eclectic, avant garde culinary hot pot of restaurants around West Loop. Experience a lively nightlife of arts and entertainment- this is the home of Jazz and blues, speakeasy bars, Steppenwolf theatre and Broadway shows. North Michigan Avenue, the Magnificent Mile, is one of the world’s best shopping destinations, rivaling 5th Ave, New York and Rodeo Drive, Beverly Hills. 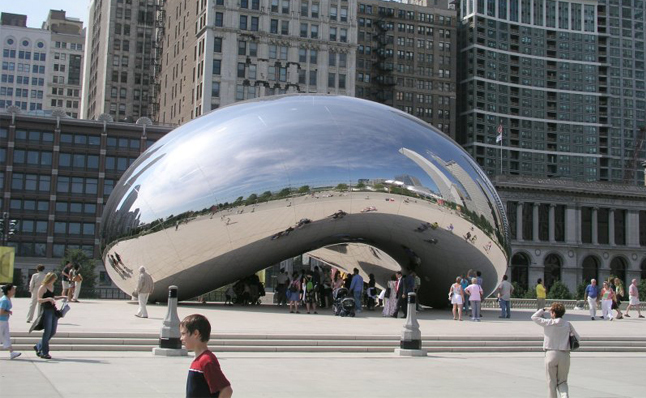 Browse world class art galleries, science museums and the magnificently-designed Millennium Park. Sports fans will have a ball – soccer and baseball, the Chicago Bears to the White Sox. 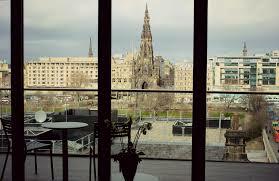 Why stay in an Edinburgh Hotel when you can experience a luxury, private Penthouse? Hidden away in the Medieval maze of cobbled alleyways off the Royal Mile, the Old Town Chambers is located in a central courtyard. With easy access to Waverley station and the airport bus terminus, the atmosphere of the quintessential Unesco World Heritage site of the Old Town is a prime location for visitors to stay. 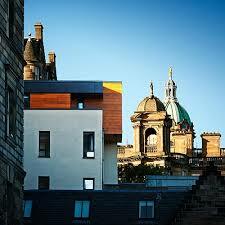 At the Scottish Property Awards 2014, the £45 million Advocate’s Close project won Development of the Year. This exciting regeneration has created these 5 star Serviced Apartments, (as well as a hotel, bars, restaurants), renovating 15th-18th century townhouses with stunning contemporary design while preserving architectural heritage. My partner Ken and I walked just a few steps from the High Street down Roxburgh Close to find Old Town Chambers reception. We were personally escorted by Mike along the corridor to Suite 11 – a two bedroom, duplex Penthouse. I knew we were booked into a Penthouse before arrival but had no idea what an extraordinary, iconic view we would have right across the city skyline – The Balmoral hotel, Scott Monument, Princes Street Gardens – we could even see the sleek new Trams snaking back and forward. As Mike showed us around and we explored room by room, it really felt that we were viewing the flat as potential purchasers! This is our own private, spacious, luxury apartment – at least for the next couple of days. Up the stairs from the front door we enter a spacious open plan living and dining room. French windows open on to a fabulous balcony with table and chairs for al fresco drinking/dining. From the master bedroom round the corner into a lavish bathroom with a fabulous roll top bath at the window – we have a bath with a city view!. 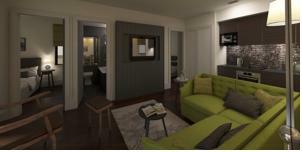 Across the hall, a second double bedroom and shower room. 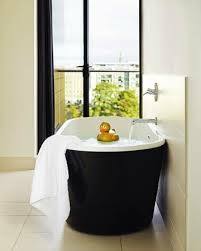 All essentials provided, Egyptian cotton sheets, soft towels and Cowshed/ White company toiletries. The bespoke furnishings are excellent quality – polished wood, tiles, fabrics – I loved the sumptuously comfortable lime green sofa in the living room – expect wool throws and Scottish tweed from Harris and Bute. A Smart TV and free Wifi too. The kitchen has everything for the budding Masterchef, all domestic appliances – and even a Nespresso coffee machine. My only quibble is that if you are under 5ft 8” or so, the cabinet shelves and microwave are far too high to reach. The Reception staff will assist with restaurant suggestions, what to see and do and directions. This is not a Hotel of course and if you need a full Concierge service, Call Alfred can arrange pretty much anything. With top West End musicals often coming to town, special Theatre/accommodation packages can also be booked. When reserving your apartment you can pre-order a grocery delivery, even a bottle of wine or something delicious for your first breakfast. On-line supermarket shoppers could have groceries delivered to the Apartments prior to arrival. We settled in so quickly, appreciating the space, décor, comfort and facilities. It was bliss just sitting on the balcony with a glass of wine and a snack in the late afternoon. From this level, we had a bird’s eye view looking down at the baronial architecture of Cockburn Street with its turrets and towers. I can’t think of a hotel room with an open outlook like this. Staying here for just a couple of days or so, eating out is probably easier than preparing dinner in-house. You will be spoilt for choice with all the pubs and restaurants nearby. Adjacent to the Chambers, as part of the architectural project, is the Devil’s Advocate on Advocate’s Close and warmly recommended to guests. This former Water Pump house has been imaginatively revamped into a contemporary Tavern; original stone and brickwork, industrial décor, copper pipe lamps, comfy leather banquettes. It was recently voted one of the ten Coolest new Bars in the UK by Esquire magazine. 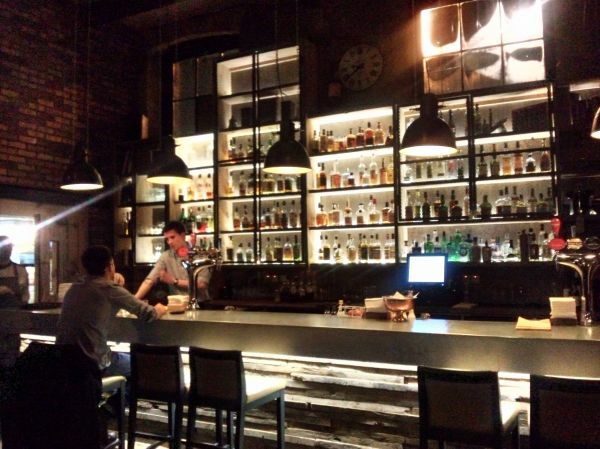 This is a speciality whisky bar but the professional team of mixologists concoct an ingenious range of cocktails. I sipped an exceedingly refreshing and very sophisticated Rum Punch. Ken chose the Monkey Puzzle cocktail – whisky, stout, beetroot and egg white foam – simply divine was the verdict. The food is equally imaginative, freshly prepared, seriously gourmet pub grub. The good thing is that even if you sample a few cocktails here you just need to walk a few steps up the Close back “home” to the Chambers. After a comfortable night’s sleep, we sat on our balcony sipping the Nespresso coffee with a breakfast croissant, watching the hustle and bustle of the city below. It’s the concept of privacy and independence of staying in our own apartment which is so relaxing. A fabulous bath for 2? The Old Town Chambers offers a selection of distinctively-designed one, two and three bedroom suites and penthouses, ideal accommodation for couples, families, friends, and for business and leisure city visitors. A few signature properties feature the original old Townhouse stone walls, fireplaces and gabled ceilings. The Old Town location is near the Castle, Palace and key visitor attractions, yet five minutes walk to the New Town (Harvey Nichols and Multrees Walk designer shops), art galleries, theatres, bars, restaurants, nightlife. Why book a standard city hotel bedroom when you can experience unique “home from home” facilities and 5 star lifestyle of an entire Apartment ? 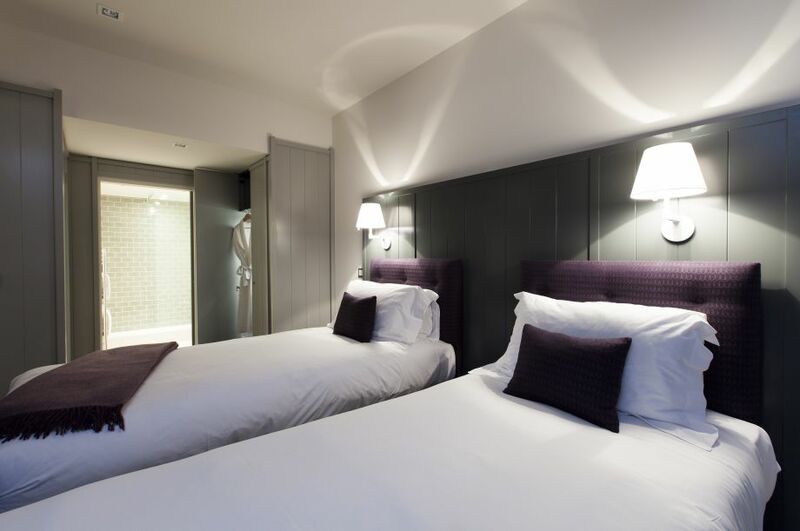 Whether planning a romantic city break for two, a family holiday during the Festival in August, a shopping-theatre weekend with the girls – your temporary address in Edinburgh should be the Old Town Chambers. Writer: David Haig. Director: John Dove. Perhaps the most important weather forecast ever made was for D-day, the Allied invasion of France in 1944. The essential conditions were a full moon, a low tide, little cloud cover, light winds and low seas. There would be a full moon and low tide on 5th, 6th and 7th June, but what about the weather? 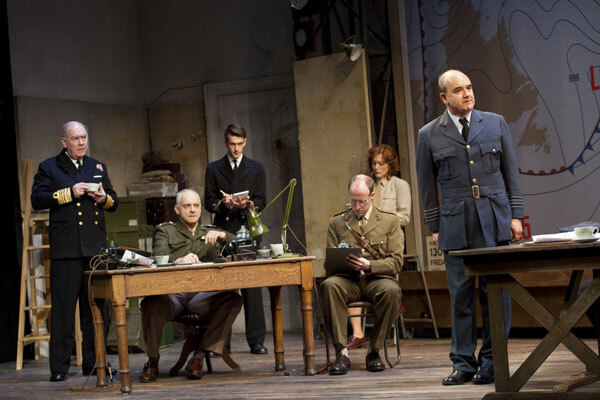 Based on a true story, “Pressure” by renowned stage, TV and film actor, David Haig, re-creates the final, crucial days of planning Operation Overlord under General Eisenhower. The setting is the meteorologists’ office at the Supreme Command HQ, Southwick House, Portsmouth. A vast weather map of the UK, Europe, Atlantic Ocean and USA, dominates the room. The date is 1300 GMT, Friday 2 June, 1944. The décor and furnishings capture the period – muddy-mustard walls, a couple of wooden desks, telephone, anglepoise lamps, shabby chairs, filing cabinets. A French window opens onto a balcony – the droning sound of RAF fighter bombers can be heard outside. Marching briskly into the room is Group Captain Dr. James Stagg – he looks distastefully at the surroundings, dropping his briefcase on a desk. He immediately barks orders at a young Army clerk, Kay Summersby, to arrange more telephones and a typewriter. Dr Stagg, a Scottish Physicist and superintendent at Kew Observatory, has been appointed the chief meteorological adviser to Eisenhower, working in consultation with the American Colonel Irving Krick. A mood of tension permeates the atmosphere as the British and American Command team enter the room for a meeting –General Eisenhower, Admiral Bertie Ramsay, Air Chief Marshall Leigh-Mallory, General Spaatz, Flight Lieutentant Carter. With three days before the proposed date for D day, the allied forces are awaiting instructions. All that Eisenhower requires is an accurate weather forecast. Looking out at the blue sky, Krick is convinced the glorious sun will continue, his theory is based on “the proof is in the past”, from the weather pattern of June 1929. But Stagg is convinced stormy weather is on the way caused by the jet stream blowing a force 6 gale into the English channel – “there is nothing predictable about British weather”, he declares dogmatically. The Command team work day and night, sustained by black coffee, gathering facts, figures, data, telephones ringing, orders given, tempers flaring, the countdown has started to make the final decision. June 4th – D Day minus one. Stagg stands centre stage, studying the swirling lines of isobars, red marked zones L4, L 5, L6, H, H on the weather chart. He trusts his instinct that the Low pressure is looming and the fine weather will turn. But the sun still blazes down on Portsmouth and Krick concentrates on the high pressure over the Azores. The two men are like sparring partners in a boxing match, with Eisenhower as the referee. But whose decision can he trust if they don’t agree? David Haig captures Dr Stagg’s serious intellect and stoic stubbornness with the clear, crisp tones of a middle class Edinburgh accent perfectly pitched. As the drama intensifies, both in his professional role and personal family life, we see a chink of a sensitive soul beneath his stern expression. Likewise, Malcolm Sinclair portrays Eisenhower’s military persona as well as the private man, his jacket off, sipping whisky, munching a doughnut. The contrast in personality, attitude and language between the American and the Scotsman is subtly dramatised in several poignant scenes. Observing from the sidelines, Kay Summersby (a charming performance by Laura Rogers), understands the critical situation for the two men, with caring efficiency. As we approach the 70th anniversary of D Day, this is a timely tribute to James Stagg, the unsung hero whose courageous weather forecast changed the course of history. The realistic sense of place, period and fast paced action of this thrilling, compassionate wartime tale is quite extraordinary – its dramatic punch hits you with the force of an electric storm. In short, “Pressure” is a theatrical masterpiece. These grand seaview apartments were given to General Eisenhower in recognition of his wartime achievements. He stayed here with his family on several occasions as General and later as US President. Today, they offer luxury accommodation for up to 12 guests, retaining period memorabilia and furnishings.